Adsorbent, natural grapefruit peel (GFP) exhibit good efficacy to adsorb a highly toxic radioactive heavy metal, uranium(VI). Through the fixed-bed column technique adsorption characteristics of uranium(VI) is observed at different flow rate, bed depth, influent uranium(VI) concentration and particle size of adsorbent. The results showed that adsorption reached saturation faster with increasing the flow rate and influent uranium(VI) concentration while it was the advantage of column adsorption with the increase in the GFP bed. The data were fitted to the Thomas model, the Yan model, the Clark model and the mass transfer model by nonlinear regressive analysis. When the flow rate was 8.0 mL min−1 and the influent concentration of uranium(VI) was 90 mg L−1, the maximum adsorption quantity reached 104.1 mg g−1 according to the Thomas model. The bed depth service time model was applied to predict the service times with other flow rate and initial concentration. The theoretical breakthrough curve was compared with experimental breakthrough curve profile in the dynamic process. The results showed that the Yan model was better for the description of breakthrough curves at the experimental conditions than the Thomas and the Clark models. 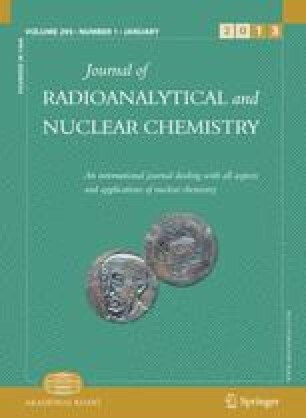 The saturated column was regenerated by 0.05 mol L−1 hydrogen chloride solution and GFP could be reused in uranium(VI) removal. This work was supported by the Education Department of Henan Province in China (No. 2010A610003) and Henan Science and Technology Department in China (No. 122300410163).